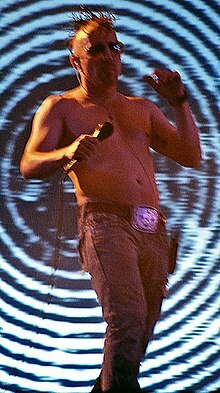 Maynard James Keenan (born James Herbert Keenan on April 17, 1964) is an American rock singer, songwriter, musician, and producer. He has been a member of the band Tool since 1990 and was a member of the band A Perfect Circle from 1999 to 2005. Tool is not Slayer. I went to art school. I spent three years in the military. There's more to me than throwing devil horns. Aidin Vaziri (January 2, 2009) "Maynard James Keenan: Hard rocker, winemaker. 5 Questions. ", San Francisco Chronicle, p. E3. I think there’s a reason why wine figures into so many religions. There’s something transcendent about it. It’s sort of the way that music is more than the sum of its parts. You have all these elements that make up the terroir that wine can communicate. Matthew Lickona (December 24, 2008) "Hedonistic", San Diego Reader. You can grow grapes in almost any part of the world. You just have to develop your palate enough to realize wine is an expression of the place where you make it. You don't have to take over the world; just be an artist and express your area. George Varga (November 7, 2008) "Tool lead singer hits the right notes in the winemaking community", The San Diego Union-Tribune, p. E-1. For the music, it’s not about the individual — so the more you let the music speak for yourself, the more powerful the music will be. Carl Kozlowski (September 11, 2008) "Taste in the making: Tool’s Maynard James Keenan shifts his focus from writing dark lyrics to creating zesty wines", Pasadena Weekly. Southland Publishing. It’s in my blood. My great-grandfather made wine and it’s a tradition I want to pass on to my son. On his work with his vineyard in Northern Arizona and wine label of the same name, Caduceus — reported in Jon Dolan (August 2006) "33 Things You Should Know About Tool", Blender, Alpha Media Group Inc. It's the role of us to run our government, the government by the people, for the people, and I don't think our government is listening to the people. It's our role as patriots to question them, because we elected them. And if they're not fairly and accurately representing us, it's the job of the people, the patriots, to take their country back. George Varga (October 31, 2004) "Fired up and emoting on the state of politics, and more", The San Diego Union-Tribune, p. F-5. Every now and then, you get people who tend to forget what this country is about, which is a melting pot of races and cultures and freedom of speech. George Varga (October 25, 2001) "The Tool Man: Blistering band's frontman puts his mind to the world's problems", The San Diego Union-Tribune, p. 4. The army influences everything I do. Certainly it teaches you discipline, which is a necessary element of development. I think there's more of a collaborative understanding in the band because of that. Iain Shedden (July 20, 2001) "Tool a bigger `threat' than any rapper", The Australian, p. 10. The process that we go through in recording with Tool is very organic, but at the same time it is very thought out. There is a very left-brain process of dissecting what we're doing and drawing from source material; it's very research oriented and esoteric. Neil Strauss (March 29, 2000) "A brain comes full circle: Rock musician Maynard James Keenan, of the bands Tool and A Perfect Circle", The New York Times, p. B3. One of my biggest heroes in music has been David Bowie. He's said, `I'm going to be a painter now, or I'm going to do some films,' and his audience is very forgiving, because they understand him as an artist. Whether you agree or like the result, you respect that he's expressing his artistic feelings. The Record staff (March 22, 2000) "Music News & Notes", The Record, p. Y4. On why his band Tool is like a washing machine — reported in Jim Sullivan (July 4, 1997) "Lollapalooza Still Packs A Wallop", Boston Globe, p. D1. You really should be able to feel the higher power of music and be moved by it, rather than listening to me waffle on and having to explain it. Steve Morse ( November 15, 1996) "Sonic Evolution With the Use of Tool", Boston Globe, p. D14. MaynardJamesKeenan.com, currently redirecting to the Puscifer website. Wine Spectator Online, where Maynard maintained a blog about wine collecting and winemaking from 2006 to 2008. This page was last edited on 9 March 2017, at 23:52.